Lori's Happy Place: Finally Finished!!!!! 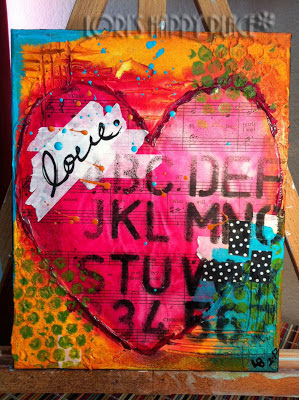 Ok, NO the heart canvas did not need a solid month to dry before I could paint it. Life got busy and it has taken me exactly a month to get back to it. But, today was finally the day. Woohoo!!! (If you want to see how it started, look back on February 15th) I absolutely LOVE how it turned out. So many fun techniques! Loved the texture that happens every time I use modeling paste. It takes a while to dry (not a month), but it is so worth it when you put the paint on and see what fun things happening in all the nooks and crannies. So much fun. And finally, after one solid month, drum roll please........................... My heart!! It is only an 8x10 canvas, so it was a little over kill to use my beautiful new easel. Will have to do a bigger project next time, so I can use it instead of the table top one. I am having so much fun each month learning some great techniques and just giving myself the opportunity to create. Life can get busy, and if I had never signed up to do this, I know that I would let life win and never get around to doing what I really love and want to do. Thanks Donna.